How do we best advance the Third P, our preference foresight, the one we care the most about in human society? 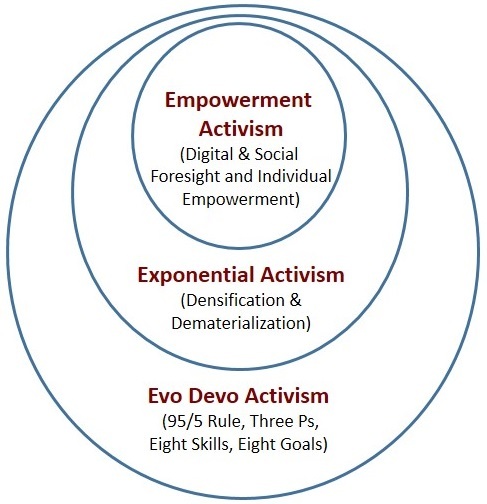 How can we use evo devo models, including the Five Goals and Ten Values, to act in ways that make things better for individuals (empowerment activism) or societies (progress activism)? How do we best resolve our conflicting individual and social agendas, take best advantage of opportunities, steer away from environmental downsides and risks, and manage the downsides and risks in our strategies? Evo devo models offer a framework for thinking broadly about normative (values, preferences) foresight, in a wide variety of complex systems. They help us view human social systems from a bigger picture, universal frame. Perhaps their most important benefit, for leaders and foresighters, is their proposal that in all normative, strategic, agenda-setting, activist activities, we will do best to continually keep in mind two fundamental, perennially opposing ways of view the world: evolution and development. 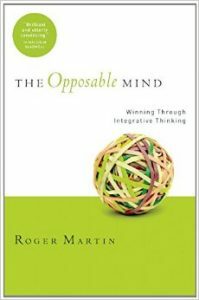 Roger Martin’s insightful book on leadership, The Opposable Mind: How Successful Leaders Win Through Integrative Thinking (2007) makes this point well. All good leaders are constantly keeping multiple opposing viewpoints in mind. The key to adaptive integrative thinking is to make sure those opposing “binaries” are the most important viewpoints. You will have to decide for yourself if these binaries are the best categories you can use to make sense of the world, and generate visions for personal empowerment and social progress. Evo Devo models offer us two very fundamental process viewpoints on which to build our understanding of adaptation, values, and intelligence. While they are quite preliminary today, I think evo devo models are already useful enough to help guide our activism, and we’ll briefly consider that important emerging topic in this section. In Chapter 1 we considered the tension between Growth-Innovation-Freedom, and Sustainability-Limits-Rights perspectives, our two current dominant social schools of foresight. We can now understand the universal value of each, when seen in an evo devo frame. As mentioned in that chapter, empowerment foresight and activism, can be understood as a synthesis of these two perspectives, and an emerging third school of foresight and action. When we recognize the exponential power of digital technologies to impact personal and social empowerment, for good or ill, via the twin trends of densification and dematerialization, as in Chapter 7, we get exponential foresight and activism, which seems a very helpful generalization and extension of digital and social empowerment activism. Finally, when we consider how models of complexity and change like the 95/5 Rule, the Three Ps, the Eight Skills, the Five Goals, and the Ten Values, are likely to impact personal and social empowerment, again for good or ill, we arrive at our most broadly useful, specific, and speculative model of all, evo devo foresight and activism. This is the most general model for growing social adaptiveness, and achieving social progress, that we will offer in this Guide. Again, the cartoon at right summarizes these three models of normative (vision and values-based) foresight and action. We hope they are at least somewhat useful in your own journey to understand where the world is going, and how to best create social progress. Beyond recognizing the unique power of digital technologies to improve lives, we can help our clients to better see and use accelerating D&D technologies wisely, to help us be more healthy, wealthy, evidence-based, and self-actualized. We can ensure everyone has their fair share of accelerating technical productivity via social safety nets and entitlements that rise directly with the exponential capabilities of our machines. We can ensure we make nanotechnology, hardware, software, and smart agents that defend and promote our values and serve us well. Finally, we can look to models like evo devo foresight to guide our activism. There are many other tensions about which exponential and evo devo foresight can inform us, and spur us to action. All of this activism involves conflict, and the conviction that we are doing the right thing. Some of the positions I’ll advocate now may not be something you can easily convince others of, especially if they are not acceleration- or evo devo-oriented in their thinking. But figuring out your own position, and where the world is going and wants to go, whether you want it to or not, is the foundation of evo devo activism. The better we understand the probable future, the better we can steer toward our own preferable futures within the constraint of the probable. What others are most willing to hear, in order to join your cause, and the best ways you can approach them, is a separate issue we won’t address here. All activists must find out the most practical and yet ethical ways to drive change themselves, as they engage in their important work. But effective activism and leadership always starts with figuring out what most needs to be done.